At her March 19 presidential campaign event in Davenport, IA, Sen. Kirsten Gillibrand (D-NY) fielded a series of questions from potential voters on a wide range of topics. However, it was a very specific part of her answer to a broadly worded question about immigration that made news. Gillibrand was pretty clearly saying that she supports a pathway to citizenship for undocumented immigrants, noting that these are people who in many cases already make contributions into Social Security and local school districts via taxes. The YouTube clip was deceptively titled “Sen. Gillibrand: Expand Social Security To All Illegal Immigrants,” a distortion of what she said. The clip was posted to YouTube at 9:33 p.m. EDT. Less than 90 minutes later, Fox News’ Laura Ingraham played the clip for her audience, adopting the RNC’s misleading interpretation. That, of course, is untrue and gives the impression that Gillibrand wants to start cutting checks to undocumented immigrants. In reality, what she’s proposing would result in more money being paid in to Social Security, with more people who are currently undocumented being able to do things aboveboard. SEAN HANNITY (HOST): Doesn't a sanctuary state or city, governor, aren't they aiding and abetting criminal activity? Isn't this a case of rewarding illegal activity? And if we only pay attention to the laws we want, can we have a system of laws? MIKE HUCKABEE (FOX NEWS CONTRIBUTOR): Sean, you are so outdated. You are going to have to get in the groove, man. Don't you know that if a person comes here illegally, not only should -- well, listen, Sean, let's not only give them grandma's Social Security, let's toss in a car and maybe rent for, you know, a nice home. I'm just amazed that people are applauding this kind of stuff. And I hope Kirsten Gillibrand has to go out and talk to people in their 70s who can barely afford food and tell them that they're going to get not their Social Security raised because we're going to be giving it to people who broke into this country illegally. I can't wait to see whether she gets applause in a roomful of retirees, living off of Social Security, when she makes that ridiculous proposal. Up to this point, Fox News had covered the story only on what it bills as its “opinion” shows. That changed when Fox News @ Night picked it up. During the March 20 show, Bream delivered the story while a series of chyrons appeared on the screen below her, each hyping the RNC-crafted distortion and with one even including a fabricated quote about Social Security being a right (Gillibrand said people should have the right to pay into Social Security, not that Social Security benefits were a right). The segment was barely distinguishable from the network’s “opinion” side commentary. The following morning, the story appeared on “news” and “opinion” programs, doing away with the illusion that there’s a line between the two. This could be a big problem for Fox. Fox & Friends and America’s Newsroom both covered the story during their March 21 broadcasts (and Fox & Friends did again on March 22), both repeating the spin put on it by the RNC. 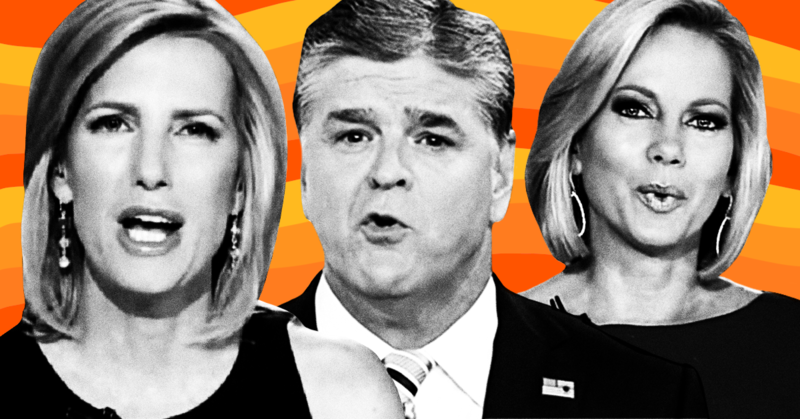 In an effort to keep advertisers from walking out the door over the white nationalist rhetoric of the likes of Ingraham and Tucker Carlson, the anti-Muslim commentary of Jeanine Pirro, or the conspiracy-mongering of Sean Hannity, Fox has been trying to emphasize the work of its news division. But there’s only so much Shepard Smith and Chris Wallace can do for the channel’s credibility, as others who the network has put forward as able to handle tasks such as debate moderation -- namely Bret Baier and Martha MacCallum -- are either dangerously sloppy or overtly partisan. While the network’s No. 1 fan, who happens to be the president of the United States, would almost certainly love it if Fox were to run even more opinion programming, the news side serves a purpose as a smokescreen. The truth is that there’s no real distinction between what counts as news and opinion at Fox. The two sides feed into each other, and in this case, both were fed by the RNC. Fox News is a propaganda network, and it’s starting to reflect poorly on the skittish advertisers that remain. Parker Molloy is an editor at large at Media Matters, where she has worked since September 2018. She has a bachelor’s degree in arts, entertainment, and media management from Columbia College Chicago. She previously worked at Upworthy as a senior writer.